“Well it’s a stereotype because it’s true!” Ever heard this phrase, or said it yourself? Franchesca Ramsey’s revealing how stereotypes really work in your brain – and how you might be falling for unfair biases. “It doesn’t hurt anyone.” We see these responses to the topic of cultural appropriation all the time. 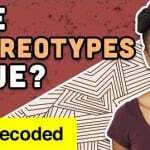 Does Chescaleigh’s breakdown correct any misconceptions you believe? Do you know why the US began celebrating Thanksgiving, what the first one was like, or even where the turkey comes from? Franchesca Ramsey’s busting all the myths we think are facts. If you’ve had a white person interrupt you to explain how racism works, you may have been whitesplained. But you’ve never witnessed whitesplaining like this – here’s Franchesca Ramsey’s hilarious take. Ever wonder about the stereotype of black people loving fried chicken and watermelon? Chescaleigh’s breaking down what it really means. These foods may be delicious, but this stereotype is revolting. Does Racial Bias Affect Your Dating Life? “Wow, you’re cute for a ______!” Have you ever dated outside of your race(s)? Franchesca “Chescaleigh” Ramsey’s got some disturbing info that shows attraction is more complicated than you think. Ever heard or thought that a victim of police brutality should’ve just done something differently? Here’s why this victim-blaming is ridiculous – and why we need to start holding police accountable instead. “When cell phone commercials get too real.” How can we protect ourselves when police officers’ biases so often lead to brutality against people of color? Franchesca “Chescaleigh” Ramsey’s got one idea, with a dash of humor to confront this issue head on.